You would have to be mad not to wear this Anthropologie "Sugar and Cream" dress to an afternoon of tea. 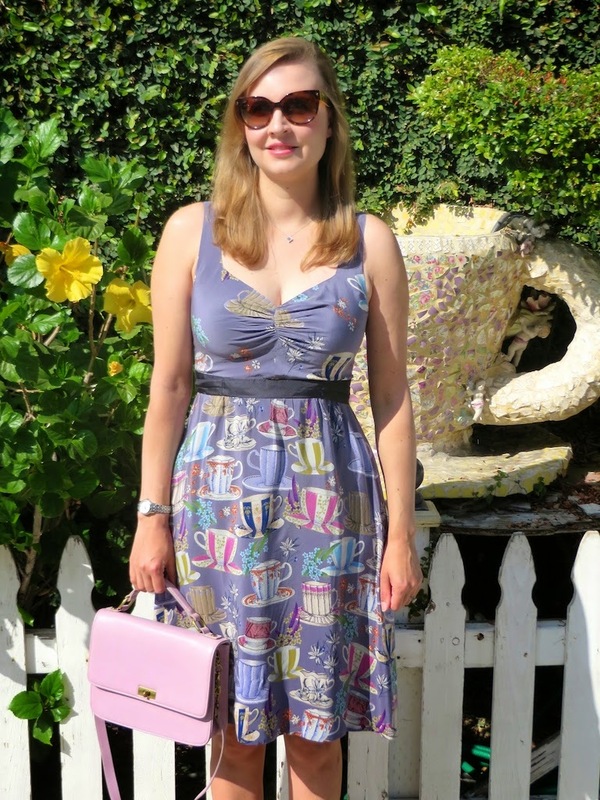 This weekend I did just that, breaking out this dress with its crazy tea cups for the occasion of nibbling on scones, clotted cream, tea sandwiches, and of course sipping tea. What a civilized way to spend a Saturday afternoon! My love of having tea started with my best friend in college. We had this favorite tea spot that we would frequent afternoons. Sometimes we would even bring our laptops and do school work over tea. My favorite thing about that spot, in addition to the great company and conversation, was their delightful raspberry Linzer cookies. Sadly, this tea haven is now out of business, so I have been on a quest for my new favorite place to raise my pinky and daintily sip tea. 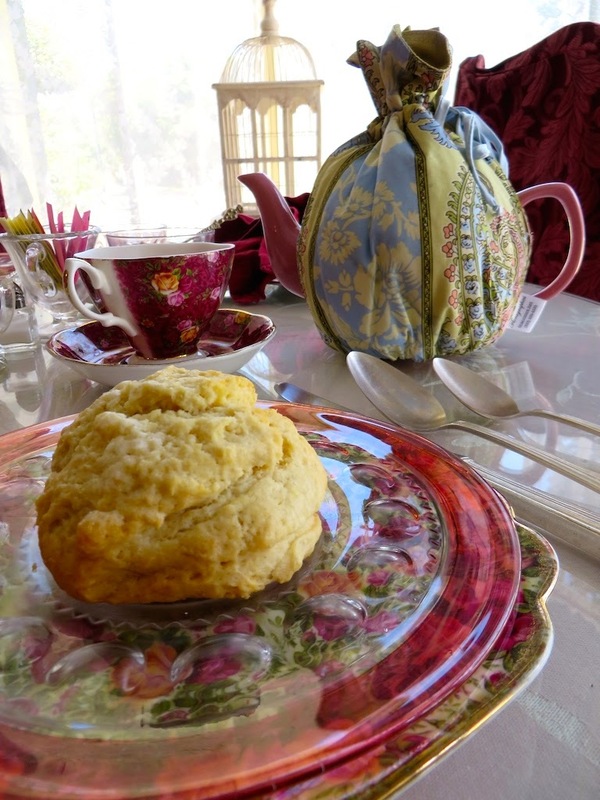 So far I have experienced quite a few tea rooms in the greater Los Angeles area, so if you ever need a recommendation, you know who to ask! Here are a few shots of our mad tea party, including tea cozies, scones, sorbet and those cute crustless sandwiches that are so refined! Thanks Amber! I love the pattern too. I hope you are having a great week! 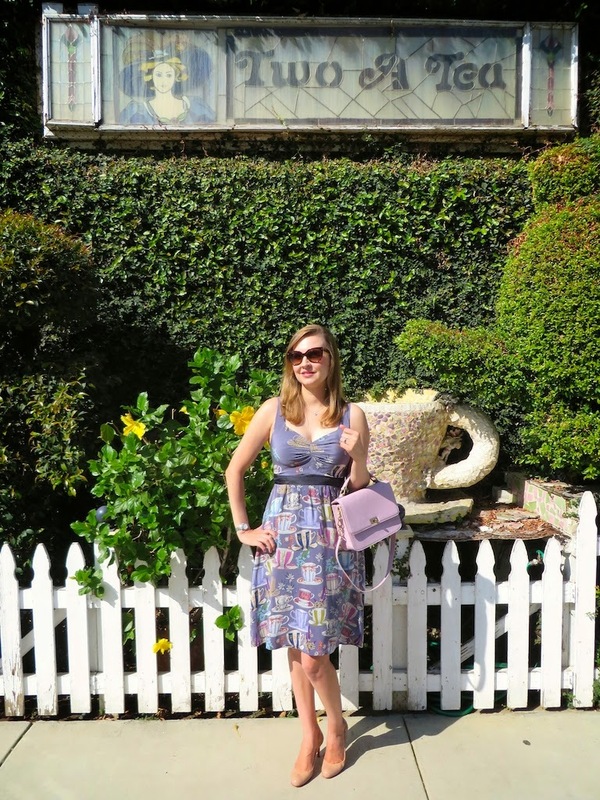 OMG that is the cutest dress ever Katie/ Love the retro-inspired print and style of it and how perfect it is for Tea. I also love the light-wash color of your denim jacket. You are stunning!! Happy Monday! I also fell in love with this dress when it first came out about 5 years ago at Anthro. Since I go out to tea a lot I thought the tea cups were the perfect subject matter for a dress! oh I just love afternoon tea! I know! Afternoon tea is so much fun. It's a great way to spend the day. The purse is divine! Cute dress and pictures! I think I need a tea now! 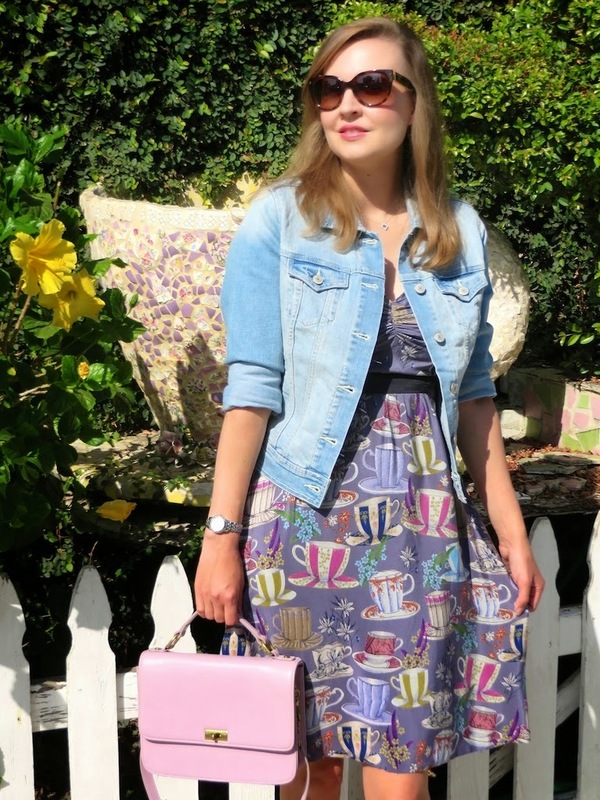 Love the purse, and the print and shape of the dress is so pretty on you! Love it. Thanks Jessica! I am glad to meet a fellow tea lover! Hopefully someone will open up a tea place by you soon. I can't believe how many we have out here in L.A.
That dress is so stinkin adorable! I LOVE the cute pattern! Thanks so much for sharing! I wat that so badly in my closet! Thanks! Sometimes this dress pops up on eBay. I am totally in love with the print too, so much so that I sprung for it at full price years ago. Thanks for the heads up on your link up. I will certainly stop by to check it out!